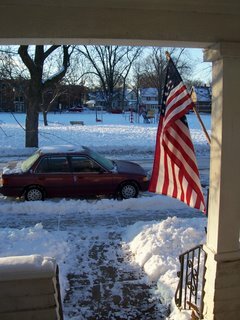 The Madison Freedom Fighter: Flag Stolen from Bowen Ct! My American Flag was stolen this past weekend and I am offering a 100 dollar reward for its safe return or for information leading to a safe recovery of the flag. The flag, which was featured on the cover of the Isthmus and is pictured left, has lead many a pro-troop rally and holds a special place in Conservative History in Madison. As a side note, I am amazed at the extent of "free speech" in Madison. You can have "free speech", as long as it is anti-war, anti-American, or liberal. Picture from Brad V. at LIB. why do you assume this theft was an anti-war statement? Maybe someone just wanted a flag that they could fly proudly themselves. Conversely, why do you assume that everyone sees flying the flag as a pro-war statement? I've carried the flag at anti-war protests. Don't jump to conclusions. Geez! You'd make one lousy detective! Tell me about living in Madison under the cruel and oppressive Liberal rule: I've had a John Kerry bumper sticker torn off my car and a lawn sign taken. Maybe my sticker and sign weren't sufficiently "anti-war, anti-American, or liberal" for the thug's tastes, but as a fellow liberal, I think I deserved a warning first. That Kerry sticker was very special to me. It's intriguing to note the author's supposed disdain for violations of free speech, while simultaneously viewing spaces with deleted postings. Of course, the possibility that the flag was stolen in an apolitical manner, by drunkards or what have you, isn't discussed as a possibility. Nope, let's turn it into an agitprop piece! That was me, deleting my own post, sort of accidentally. No fault of the blog owner's; Blogger was being very scripty and kind of wandered off. wow, nothing like jumping to your own conclusions, Nathan. I thought of the possibility of a drunk guy coming and snapping off my American Flag, but then I thought that no conservative, flag-loving American would do such a thing, as even when drunk, we still love our country and respect our flag. Thus, it was either a drunk liberal or a sober one. Have your pick. Really it doesn't matter, since there is little difference between a drunk and sober liberal. I'll have you all know that Greenbush neighborhood does not tolerate drunkeness. "no conservative, flag-loving American would do such a thing ... even when drunk". Oh come on! I'm just now beginning to grasp how small and unimaginative your thinking is and how quick you are to force the facts to meet your preconceptions. Take a deep breath Bob and honestly ask yourself what you know about this theft. I'm sory for your loss of what I'm sure was a sentimental keepsake but you really don't know what happened or what kind of person took it or what he (or she) was thinking when they did. Does jfm live in Madison?